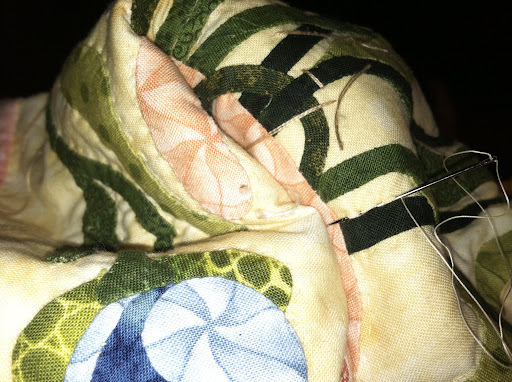 Working on my hand quilting, amazingly it is much faster than I imagined. 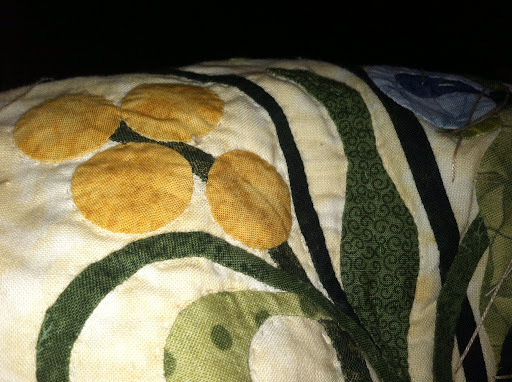 I have started with going around the appliqué and have finished 2.5 of the 7 blocks. Now you have to see one of the panels, it really can not be considered a block as it goes across the whole top. I started this in 2009 according to my computer when I scanned the pattern for printing on freezer paper. Took me quite a while to make all the pieces and then get them sewn onto the background. I am pretty proud of the fact that I am as far into it as I am. 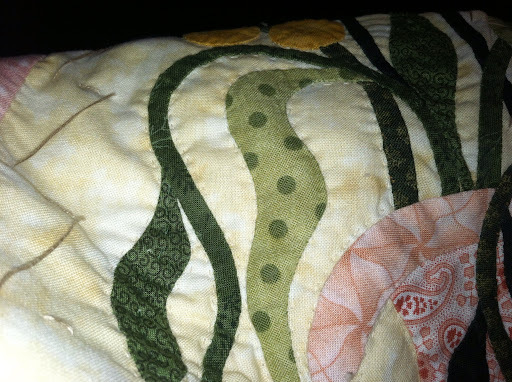 There are bits of space between the flowers that are going to need some kind of quilting as I want to push the flowers forward. Any suggestions? For between the flowers you could always do an echo quilt of your ditch stitching.... Or just a micro stipple although that would be very time consuming! Can't wait to see how it comes out! Congratulations on all of that hand stitching... It looks awesome! A diagonal cross hatch is a traditional hand quilting background filler - easier to do by hand as you travel between the layers behind the applique pieces, instead of stopping and starting (like you'd have to do by machine). It is looking beautiful by the way, and it will be lovely to see it finished one day! New IPAD Blog Touch App. LOVE IT!!! !